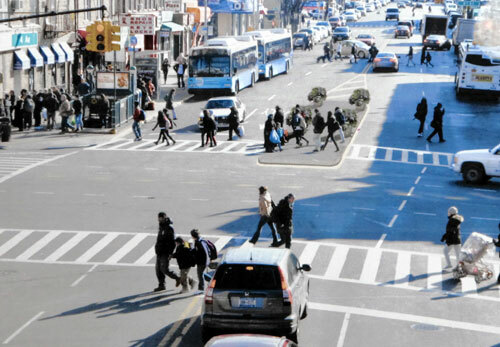 After too many pedestrians suffered personal injury or wrongful death in traffic accidents on Fourth Ave in Bay Ridge Brooklyn, New York City proposed to trim traffic lanes to slow speeding drivers. This proposal was rejected by the Brooklyn Community Board 10. According to the Brooklyn Daily, some board members said they wanted the avenue to keep its current format, even if it endangers residents walking in the neighborhood. A previous study for the National Highway Traffic Safety Administration said the six-mile thoroughfare was the third most dangerous road in Brooklyn, tied with Avenue U and Eastern Parkway. The study shows that 4 pedestrians were killed on the strip between 2008 and 2010, mostly elderly and children. This year, two pedestrians have been killed at this location. Courtesy of Department of Transportation: The city was also proposing an island to give refuge to pedestrians crossing Fourth Avenue on the southern side of 86th Street. The board rejected it as well.